Hey Siri - What can you do for me? roqyBT & roqyUSB -- bluetooth stack for iOS, allowing use of OBDII auto diagnostics, and more! BetterTouchTool is a great, feature packed FREE app that allows you to configure many gestures for your Magic Trackpad. There are several ways to find your iPhone's IMEI, but people don't generally think to just check in iTunes -- because it doesn't say anywhere in the app that you can. There's no button or hint given, but if you simply plug your phone in and open iTunes, you can change the information shown in the lines for "Serial Number" and "Phone Number" by just clicking on them. Alternate info, like your phone's IMEI, your SD card's ICCID, your iOS version's build number, and your UDID (the phone's other unique identifier that Apple likes to use for service requests) will cycle through as you click. Press twice to send the call to voicemail. Press and hold center button for about two seconds to decline the call. You�ll also hear two low beeps that confirm you the call is declined. While you're in a call, you can simply press once to end the call. Press once to switch to another call and put the current call on hold. Press the button again to switch to the first call. Press and hold the button for about two seconds to ignore the second call. 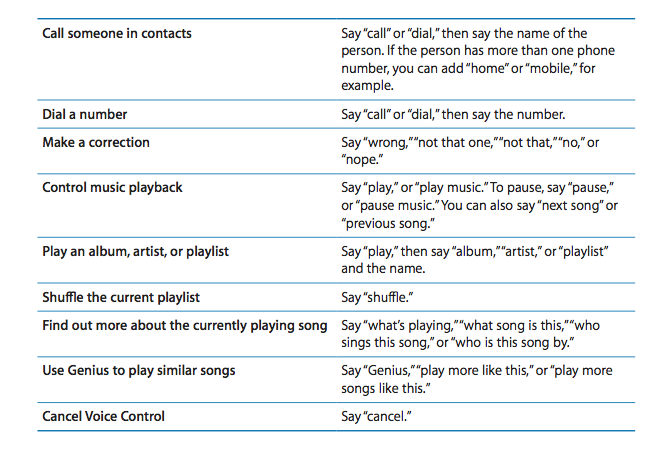 While you're not in a call, you can press the button once to activate iPod and playback your music. Press once to pause the song and press again to resume it. For iPhone 3GS, the bundled headset is enhanced with volume control buttons. You can use the "+" and "-" buttons to adjust the volume. And, one more thing. You can press and hold the center button to activate voice control, which is a new feature comes with iPhone 3GS. Dial *3001#12345#* on your iPhone then press Call. You'll now enter Field Test mode. You'll notice a signal strength indicator on the upper left hand corner of your screen. You can toggle between signal strength bars and a number by simply taping on it. At this point, press the home button to exit the app or if you would like the feature to be permanent, continue on. Don't worry, the process is completely reversible. Hold down on the Power button until you see the "slide to power off" bar. Do not power off the device.